V-2 (Velcro ends only) . Ultimat® mats provide the firm support necessary for high impact activities by older and heavier users. 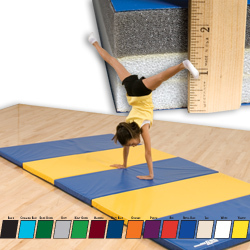 Use in physical education, gymnastic classes, cheerleading and martial arts training and more. Available in both 1' and 2' panels (1' panels lie flatter than 2' panels) that fold in 2' sections for easy handling and storage. These extra firm mats provide the high shock absorbency and "no bottoming out" characteristics required for all your high impact activities. Ultimats come complete with 2" fasteners on both ends and are also available with fasteners on all 4 sides for added size flexibility and for use as wall mats. Ultimat® mats are upholstered with a tough 18 oz. vinyl fabric. Knife coated on both sides, the polyester base fabric provides excellent tensile strength taht resists abrasions, tears and punctures. All mats resist fungus, bacteria and mildew and provide years of hard use. Specify Color(s) when ordering!